Mary Blake: I'm going to stay. Father Mullin: That's right. You're in probably the wickedest, most corrupt city, most Godless city in America. Sometimes it frightens me. I wonder what the end's going to be. But nothing can harm you if you don't allow it to because nothing in the world, no one in the world, is all bad. "Tell Me You're the Heart of All the Golden West." MGM's blockbuster was conceived originally as a vehicle for Jeanette MacDonald to co-star with some non-singing players while her normal screen partner Nelson Eddy was on a concert tour. Mr. Eddy always considered his screen roles secondary to his concert singing which was the reverse of how Jeanette felt. According to a recent book about both Eddy and MacDonald, Clark Gable had been gotten out of romantic dalliance with some hush money MGM paid some woman off with. He didn't really want to do the film, but Louis B. Mayer kind of hammerlocked him into it. MacDonald however chose Spencer Tracy for the part of Father Tim Mullin, Gable's best friend and conscience of the movie. Nevertheless the part of Blackie Norton, impresario of the Barbary Coast in 1906 San Francisco fits Gable perfectly. The man takes his pleasures where he finds them, but has a concern for the folks in his area who are getting the raw end of things from the upper crust on Nob Hill as personified by Gable's rival Jack Holt. Gable and Holt are rivals for Jeanette MacDonald as well. She's fresh from the country, a parson's daughter with a great set of soprano pipes. Both like what they see, but Holt appreciates her voice quite a bit more than Gable at first. Besides Ms. MacDonald, Gable and Holt have their differences over some of the rottenly constructed houses on the Barbary Coast and Gable wants a lot of new construction there. Of course the Earthquake of April 18, 1906 settles the whole issue of urban renewal. If the special effects Oscar was around at that time, San Francisco would have won it for sure. Even over 60 years after the film came out and with the more modern techniques of special effects available, the sight of the earthquake is still visually stunning. Gable and MacDonald did not get along on the set, Gable was more used to down to earth leading ladies like Crawford and Harlow. MacDonald and Tracy got along just fine. Her intercession with Louis B. Mayer changed the course of Tracy's career forever. Previous to San Francisco, Tracy played a whole slew of roughneck heroes in B films at Fox and his first few at MGM were in the same mold. As Father Tim Mullin, Tracy became the wise father figure (no pun intended) that the public came to know so well. He received his first Academy Award nomination for this part. Jeanette has some operatic selections and three hymns to sing during the film, The Holy City, Battle Hymn of the Republic, and Nearer My God to Thee. She also got two original songs, Would You and the title tune of the film. The song San Francisco was adopted by the city fathers of San Francisco as the city's official song. That is until Tony Bennett lost his heart there. Controversy still rages on the bay as to which should be the official song of San Francisco. San Francisco made a whole lot of money for Leo the Lion that year. It in fact inspired Darryl F. Zanuck to burn down Chicago the following year so he could get in on that disaster epic box office. 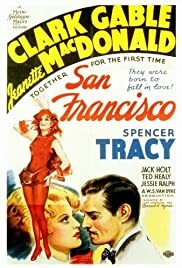 San Francisco still holds up well today, the action, the music, and Spencer Tracy's groundbreaking performance. Something for everyone.